​More than fifty years ago, a Marion teacher, Arena Hinds, held a meeting to explore the possibility of forming an association for retired teachers. Six teachers attended this first meeting to discuss how such an organization could help address some of the welfare issues of retired teachers. 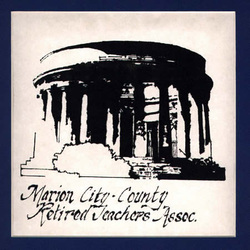 Later when Miss Hinds was in her first year of retirement, the Marion County (now known as Marion City-County) RTA was established on March 28, 1953 with 23 teachers in attendance. This new organization came to serve not only the social needs of retired teachers but also became their advocate on issues related to pensions, insurance, health care and community involvement. Over the years, the Marion City-County RTA (MCCRTA) has grown and flourished. Membership has increased from the original 23 members to nearly 300 members. Meeting times have increased from four to seven times per year with five luncheon meetings and, in recent years, two dinner meetings to accommodate the schedules of an increasing number of retired teachers wo are working after they retire. Over time, meeting locations have changed form homes to area churches, to community centers and ultimately to restaurants. In 1959, chapter members added programs and entertainment to the meetings. Today's yearly schedule includes a balance of entertainment and informative programs. In community service participation, MCCRTA members contribute countless volunteer hours to our community. Recently, as a service to future teacher retirees, MCCRTA held its first Retirement Planning Seminar, which included three speakers and a light dinner for 150 active teachers. Today's members are committed to making the efforts and adjustments necessary to assure that MCCRTA will grow and continue to fulfill the mission of its dedicated founders.